It took time for Carey to understand I wasn’t making up the fatigue I felt when we were first married. His family grew up healthy as pack mules—they went to the pharmacist instead of the doctor on the rare occasion one of them felt sick—while my bout with severe mononucleosis during our engagement began a downhill slide with my health. It left me tired all the time and seeking medical help from multiple doctors and specialists. I’ve simply never felt the same as I did before that lengthy illness. At times, I’ve cried hot tears of frustration because I am not as energetic as I’d like. “I wish I were stronger,” I said to Carey more than once when my body betrayed me—again. He’s sweet and understanding, but I know it can be hard for him, as well. I’ve also been mad at God more than once for not snapping his fingers and healing me in one fell swoop, as I know He could. The problems I have been saddled with have no immediate cure, at least not yet. However, I’m thankful for His strength in my weakness. I’m also grateful for good food, the right medicine, caring doctors, and exercise, which have all helped me immensely. It is also a huge gift that Carey has learned how to listen to me, support me, and help me in practical ways. 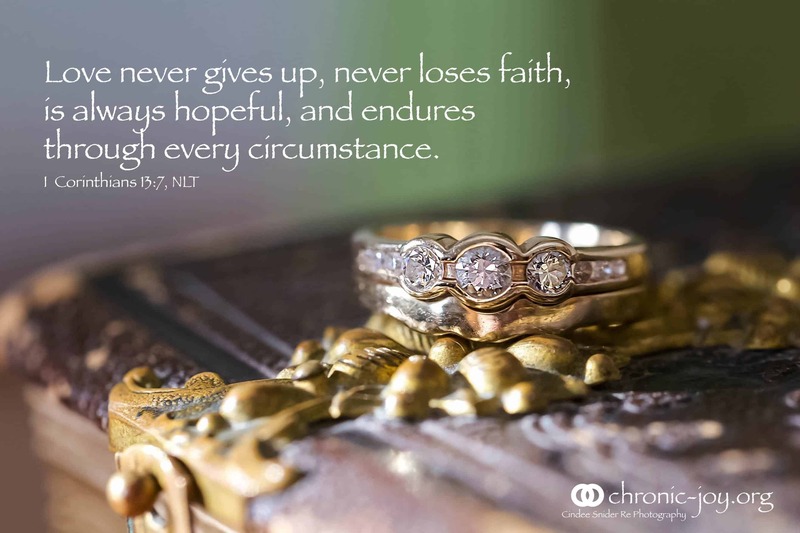 I can’t relate first-hand to what it’s been like to experience Dena’s debilitating symptoms, but I have learned my fair share of what to do (and maybe more importantly) what not to do as the spouse of someone who is suffering. If you have a sick spouse—especially when that illness is prolonged—perhaps what I’ve learned will encourage you. 1) Don’t be dismissive. I’ve usually got fuel to spare, and Dena has spent much of our time together just trying to keep up. Early in our marriage, I thought Dena should be able to shake it off when she felt ill, as if her symptoms were something she could turn off and on at will. I was unknowingly making her feel “less than,” like she didn’t have what it took to make me happy. I learned that slowing down and trying to be a more understanding was good for what ailed her. 2) Do be sensitive. This probably goes without saying. However, looking back on times when Dena dealt with her illness for months and even years on end, sometimes I would (dare I say it?) get used to it. I forgot that she was physically and emotionally dealing with pain or fatigue day in and day out. In my busyness, sometimes days would go by before I acknowledged what she was going through. In my more sensitive moments, an extended hug, a knowing glance, or a quick text let her know I cared and wanted to go through this with her. 3) Don’t forget the simple things. Never underestimate the power of a cup of fresh-brewed coffee waiting for her when she wakes; or the simple act of getting up 15 minutes earlier so she doesn’t have a pile of dishes greeting her first thing in the morning. I discovered anything, whether great or small, I could do to bear Dena’s burden went a long way in keeping her on the path to wellness. Finally, know that God never leaves us for a second. While He may (or may not) not heal our loved one here on earth, He IS always working to transform us into His image. In the midst of the valley, be deliberate about fixing your eyes on Jesus and leaving room for supernatural intervention. CAREY DYER is a husband, father, worship minister, comedian and musician who lives near Fort Worth, Texas with his wife, author/speaker Dena Dyer, and their two sons. When he’s not acting silly, he’s probably watching “Andy Griffith Show” reruns while drinking a Mountain Dew. DENA DYER is a wife to Carey and mom to two boys (her favorite roles), and an award-winning author, musician, and speaker. She loves encouraging readers and audiences to laugh at themselves and lean hard into Jesus during tough times. In her free time, she enjoys cooking, watching British television, and reading. Love at First Fight is available today. Cindee – Thank you for sharing these two sets of excerpts from Love At First Fight. I’m gonna have to add this title to my books-to-buy list!